As a result of the initiatives of the UNESCO “Slave Route” Project, there has been much progress in “breaking the silence” on the tragic and painful history of the forced displacement of Africans into a world of slavery. The UNESCO goal is to encourage international collaboration and to establish institutions for research into the African diaspora throughout the world. The Canadian experience in this regard is one model on how such institutions can be established. Based on expertise in African history centred at York University in Toronto, a group of historians, including visiting professors Toyin Falola, Robin Law, and Adebayo, demonstrated a commitment to historical research into the roots of the African diaspora. Under the inspiration of the UNESCO “Slave Route” Project, an international team of scholars assembled at York University in 1997 for a three-week “Summer Institute.” The Institute brought together a group of scholars who have since coalesced into a network of researchers. 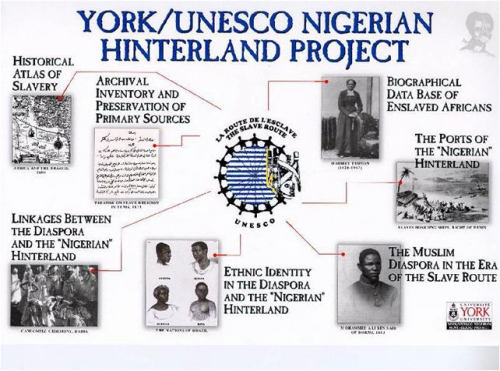 Subsequently, the Social Sciences and Humanities Research Council of Canada funded “The Nigerian Hinterland Project,” which focused on the displacement of people in the region of Nigeria through slavery. 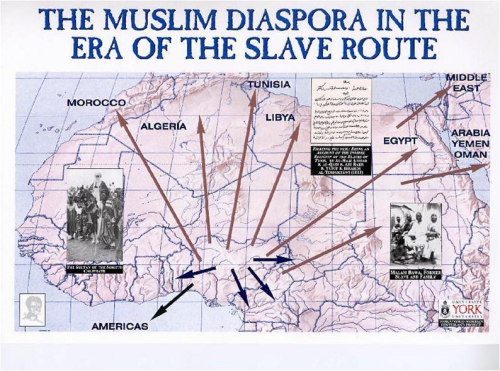 This focus included the trans-Atlantic “slave trade” as well as the movement of people within Nigeria and northward into different parts of the Muslim world and across the Sahara. The Harriet Tubman Resource Centre on the African Diaspora was then established to house the extensive documentary materials that were being assembled. In addition, the Canada Research Chair in African Diaspora History was established in 2001, with Professor Lovejoy appointed to the Chair, with the mandate of extending research into the African diaspora to Canada, thereby demonstrating the relevance of the Canada Research Chair to the local setting. 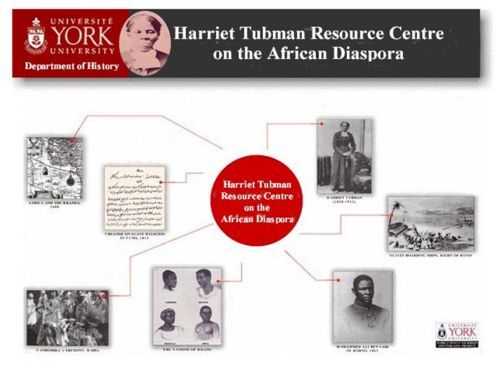 More recently, the Tubman Centre has been re-organized as a formally organized research centre at York University as the Harriet Tubman Institute for Research on the Global Migrations of African Peoples. The Tubman Institute works closely with similar institutions elsewhere in the countries of the African diaspora in a collective effort to undertake primary research and also to disseminate the results of research through publications, conferences, and outreach programming. The Harriet Tubman Institute for Research on the Global Migrations of African Peoples is a unique research facility focused on the global diaspora of Africans and their descendants. Developed in collaboration with the Canada Research Chair in African Diaspora History held by Professor Paul Lovejoy, the Tubman Institute is operated as a collective of York University faculty and students and an international Advisory Board of specialists committed to document preservation, accessibility of primary materials, graduate teaching, training and research. The Tubman Institute serves as a repository for archival documents, tapes, maps, images and other primary sources that are preserved and archived. The Tubman Institute constitutes a node in an international network of research centres associated through existing projects and affiliations that are an outgrowth of the UNESCO “Slave Route” Project and consistent with the UNESCO programs for saving and preserving endangered archives (“Memories of the World Project“). In collaboration with internationally acclaimed academic specialists, researchers and institutions, the Tubman Institute promotes the dissemination of its own and other information libraries through print and electronic publication with a searchable database and by hosting and participating in interactive dialogues, seminars and conferences. The Tubman Institute subscribes to the proposition that people have a right to know their own history. This can be achieved by making accessible all possible original documentation and by providing unbiased primary information that can inform discussion and have an impact on public policy implementation. Hence the Tubman Institute is committed to the preservation and recovery of archival documents and other materials and to making the related information accessible to the public at large. As a Research Institute for the study of the global diaspora of African peoples, the Tubman Institute promotes international collaboration, coordination of research projects, organization of conferences, training of researchers and graduate and undergraduate study, to achieve a world-class reputation as a center of academic excellence. The goal is to become a global leader in the development of a digital infrastructure for the recovery, retrieval, archiving and management of primary source documents of any kind wherever they may be found. The mobilization of knowledge will be developed through a web portal to enhance information accessibility. Our growing group of international associates (currently 44) represents 24 institutions in Africa, the Caribbean, Latin America, Europe, the United States and Canada. We are part of an international network of research centers that are associated with the UNESCO “Slave Route” project and share an interest in the UNESCO “Memory of the World program aimed at saving endangered archives. We engage in joint projects, as well as hosting symposiums and conferences that bring together leading academics, educators, and policymakers from around the world. We have linkages with historic sites such as the Buxton Museum (which recognizes Canada’s role in the struggle against slavery) and Black Creek Pioneer Village. Teams of Tubman Institute researchers determine where relevant materials are located, travel to the source, negotiate access, arrange preservation, and digitally capture often fragile and endangered content. We currently have 25 such projects underway in places such as Nigeria, Cuba, Angola, Algeria, Jamaica, and Brazil. Our resident and associate faculty, together with graduate students (currently over 25), create new knowledge through digital sourcing, analysis, interpretation and discussion. We capture the knowledge created and make it available through an extensive program of electronic and print publication and our web portal. Our faculty give lectures and seminars. We host local and international events for sharing learning both within the academic world and with the broader community. With our recent evolution from a resource centre to a formally established Institute, we are now seeking corporate, not-for-profit, and public sector partners to collaborate in an aggressive program of expansion that will demand continuing technological and social innovation. On the technology front, we equip our research teams with the latest in advanced digital capture and storage hardware and software. The nature of our work demands mobile scanning units that are easy to use and in some cases self-powered. We invest in developing advanced data-mining software to sort and process the massive quantities of information in our databank (currently archived on 2 trillabyte servers with continuous back-up through York’s mainframes, and “mirrored sites” at leading institutions around the world). Our goal is to become leaders in the development of document archiving technology and data management – creating or adapting innovative methods of searching large bodies of text in a variety of languages and formats. We will develop a sophisticated web portal to make our knowledge resources easily and globally accessible. When we speak of social innovation, we include new models of “network organization”: We will continue to seek new ways of bringing far-flung and diverse people and organizations together to create a productive, collaborative learning community that benefits all participants. We will engage in more and innovative partnerships with individuals and organizations who share our interests and goals. Just as scientific research leads to patents and useful new products, we believe that research into cultures and diversity has practical applications in shaping public policy and its implementation, educating people to act as informed citizens of a global society, and inspiring artistic creation. “Mobilizing knowledge” in this way will require strong community links, as well as collaboration with school boards, museums, libraries and archives, community services, arts and cultural groups, and informed citizens. We will start by engaging in dialogue around critical gaps in research and knowledge from a community perspective. We will collaborate on joint initiatives, hosting visiting researchers, and creating a learning centre accessible to the general public. The Tubman Institute has taken the lead in organizing an international research initiative on “Slavery, Memory, Citizenship.” The research focuses on the global migrations of African peoples from the 15th century to the present, offering a comparison of historic patterns of slavery to inform current public policy on issues arising from the persistence of slavery and racism into the 21st century. The participating scholars are committed to a sustained approach to the study of slavery by producing new mechanisms of analysis and collaborative engagement that integrates both leading-edge, innovative research and is responsive to citizen concern for greater social equity and economic justice. The research focuses on three interrelated themes: slavery, memory, citizenship. The aim is to examine the historic context of trans-Atlantic slavery, which involved millions of Africans, to reflect on that experience, on its memories and impact. Such an endeavour will inform our understanding of contemporary problems related to achieving a multicultural world based on values of peace and justice and the recognition that every person’s dignity is enhanced through an appreciation of the past and present contributions of all citizens. We intend to compare the trans-Atlantic experience of slavery in the development of the Americas with that of the African presence in the Islamic world, including the Mediterranean, and the region of the Indian Ocean. Our approach contemplates the interplay between history and memory. We want to explore this relationship through interdisciplinary collaboration and a perspective that is comparative. How do different concepts of personhood as commodification typify each of these slavery regions and thereby inform our understanding of why slavery persists into the 21st century? We propose a rich collaboration among researchers in the social sciences, law, fine arts, and humanities as means of achieving both research and social policy goals. Numerous groups claiming former slave heritage have sought their public space, sometimes achieved recognition through artistic production (past and present). Our research confronts the questions: Why is it only now that descendants of people who had been enslaved ask for recognition and (in some instances) for reparations? Why only today are issues relating to slavery at the forefront of global concern, as abolition once was in the 18th and 19th centuries? In exploring how the history and legacy of slavery (especially public/cultural responses to this legacy) can inform us about contemporary slavery and racism, we want to understand why individuals are still being commoditized and why attempts to combat racism, arbitrary confinement, and social stigmatization are often thwarted. Our worldwide network of scholars has a proven track record of productive collaboration and innovative research, which can be mobilized in the generation and dissemination of knowledge by harnessing technology to achieve groundbreaking social goals. Our plan for collaborative intellectual interaction combines research initiatives and data sharing that will enable the development of new technologies for searching voluminous quantities of historical and contemporary data. The Tubman Institute will integrate research activities and disseminate research results through innovative techniques, such as development of a flexible web-based architecture to deliver, access, preserve, and analyze data, as well as integrate a user-friendly data interface. 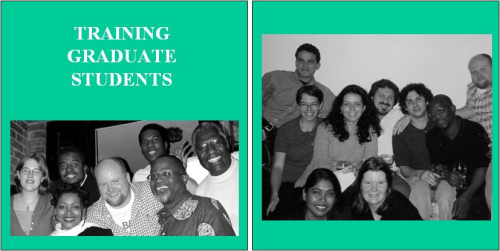 The network brings far-flung and diverse scholars and organizations together into a synergistic learning community that benefits all participants and enables the mobilization of knowledge for social policy implementation in labour law, emerging international law on reparations, human rights, gender, sexual slavery,immigration, and political and social integration. A critical aim is to cultivate the opportunity for artistic creation to serve as a means in which and through which recognition and memory sharing can better inform our understanding of history and society. As an extension of the research plan, our aim is to educate people so that they can become informed citizens of a global society where we can live in respectful co-existence. Originally presented at the National Museum of the Bahamas on the occasion of the UNESCO Commonwealth Association of Museums conference, Slavery, Abolition and Emancipation: Resources, Research and Education in Caribbean Museums, 10-15 September, 2007.